Civilization is sick and unhappy, and I claim that the root of it all is the unfree family. Children are deadened by all the forces of reaction and hate, deadened from their cradle days. They are trained to say nay to life because their young lives are one long nay. Is a free and compassionate world even possible? It is easy to get caught up in feeling that such a world could never be. Tyranny, hatred, racism, and other such horror have always been commonplace. War has been in the news since before there was a news business, as have torture and unjust imprisonment. Physical and emotional cruelty to children have ever been the norm. A healthy world can seem so distant, so far from what exists now, as to seem unreal in some way; a mere and foolish fantasy. If you've been feeling that way lately, I have good news: free and healthy societies are not only possible and practical in the real world: they exist right now. Many of them, in fact. They are small, for the most part, but no less real or important for that. I saw one of these societies, or part of it, while at the grocery store recently. A mother and four girls, maybe seven to twelve years old, were in line ahead of me. Two of the girls were daughters of the woman in line, the other two were, I think, friends, but the kids might have all been sisters. What was special about this small group? Nothing, and yet everything. It was just a woman and some kids, standing in a check-out line at the market. The girls were talking and sometimes giggling, and the mom was talking with them occasionally, with obvious affection. The kids were lively and vivacious, enjoying each other's company in a natural and pleasing fashion, and being respectful of others in the line without being servile or sullen about it. Neither the mom nor the children seemed anxious, defensive, manic, angry, needy, controlling, or otherwise visibly neurotic. At one point the youngest stepped back while talking with her sister and banged her head on a display case; the sister hugged the young one's head to her chest and patted the child's hair, perfectly naturally, nothing overblown but with unforced and instinctive concern. The incident was over in a moment and the conversation went on as if nothing had happened. No big deal, right? And yet, this group seemed a slice of heaven to me. All too often I see families and other groups or individuals who have had healthy, appropriate, and natural behavior and demeanor crushed out of them. I see children who have been disrespected so deeply that they have no respect for themselves or for others; I see parents who were hurt so badly in childhood that they cannot behave naturally or healthily with their own children. I see much worse, from time to time, and I imagine you do as well. What I saw that day at the supermarket was nothing special, and yet it was the most important thing in the world. What I saw was a small group of emotionally healthy people enjoying each other's company – exactly what human beings were made for. Even a minute or two without air creates panic; death soon follows. Several days without water will kill a person, and not pleasantly. Starvation seems impossible to most in the developed world, yet millions die a slow death from lack of food every year. Lack of love, affection and connection with our parents and others early in life contributes – hugely, as it happens  – to cancer, heart disease, diabetes, and other deadly ailments as well as to life-long misery and harmful behavior of almost every type, including depression and suicide. For that matter, an infant who is not loved at least enough to be fed, protected, and otherwise cared for will literally die. Lack of freedom (tyranny) killed hundreds of millions  in the Twentieth Century , while ruining the lives of many times that with famine, unjust imprisonment, torture, needless poverty, and in dozens of other ways, including by simply breaking the hearts and spirits of millions. That short list of needs is misleading, for the last two entries are really one. Loving someone includes respecting their freedom; to coerce a person (including a child) is to treat that person with un-love. Coercion actually erodes and destroys love; more of one always means less of the other. In similar fashion, love is necessary to any free society; a nation where love is lacking cannot long remain free, assuming it ever was. Even the market requires a widespread sense of connection (love) among the participants if it is to remain honest and workable ; laws alone cannot replace the natural respect for others that comes from widespread emotional health – which is to say, from love. 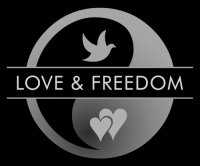 As I have written before: Love and freedom are a single unit; a duality. Love includes freedom; freedom (in the human sense) includes love. The real protection of life and property, always and everywhere, is the general recognition of the brotherhood of man. My motto for the home, in education as in life, is this: For heaven's sake, let people live their own lives. It is an attitude that fits any situation. A nuclear family, an extended family, a school, a village, a town: all can be free and loving societies. So can the larger society of a nation or even the world as a whole, and indeed nations and the world as a whole will become free and loving – or at least much closer to that than they are now – and soon, or mankind will join the countless other species that have vanished into the mists of time. Any group of human beings can be free and loving. I do not mean that people or societies can become healthy by sheer willpower; I wish they could, but that is not how people work, and even the largest societies are, for the most part, only groups of people. Our experiences early in life determine the limits of our emotional health for the rest of our days ; what we each make of that is up to us. I believe healthy change is possible on a personal level, but not widely or easily. Undoing neurosis is a worthy personal goal but not a method to pin one's hopes on for world-wide social change. For that, we need something else. We need more love and freedom to grace the lives of the very young, and we need it as widely as possible. We need dramatic, radical change on an epic scale, and we need it yesterday . It would seem that given a good start in life, almost any kind of stress can be withstood later on.
. . . we must wake up to what our schools really are: laboratories of experimentation on young minds, drill centers for the habits and attitudes that corporate society demands. Mandatory education serves children only incidentally; its real purpose is to turn them into servants. Among the most optimistic facts about human nature, given our current situation, is that small, simple changes early in life can provide enormous benefits that last a lifetime. A healthy pregnancy without drugs, alcohol, or tobacco, and with a healthy diet  supplemented by folic acid  and other nutrients  and with as little interpersonal and other stress  as possible; a gentle birth ; an affectionate infancy  with the baby never banished to solitude; and a loving, non-violent, non-coercive relationship with the child at any age – such a start to life can overcome almost anything, and most of this can be provided by any parent. ** Partners and extended family members can help; friends and neighbors and churches and charities and businesses can help. None of this involves rocket science or impossible actions. None of it requires coercive government, although as long as we are using government to penalize assault against adults, the same protection should certainly be extended to children. Speaking of assault and coercion, America's long, cruel experiment with Prussian-inspired  coercive "public education" is clearly as much a failure at educating children  as it is a success at turning them into stunted little corporate drones  and compliant, mind-addled subjects  for the ruling elite to manipulate as it pleases. What other group do we routinely force into twelve or more years of servitude, enforced by (in this case) truant officers? What other group is treated with the coercion, disrespect, and disdain  that school children so often get from teachers and other school staff? It doesn't have to be that way, and it shouldn't be that way. Treating children with respect – without violence or other coercion, and without neglect or emotional cruelty – is actually easier to do, because it makes for happy children who are pleasant to be with. It teaches children self-respect in a way no later workshop or pop-psychology book ever can. Treating children with respect (which includes insisting that they treat others with respect; as A. S. Neill pointed out, "freedom is not license") gives children a natural sense of responsibility and a comfortable understanding of how to deal with people in a healthy fashion. The report backs up that last point with a list of degrees held and careers followed by former pupils. The obvious question here is: would you rather live in a world where people had been raised with love and freedom (whether at Summerhill or wherever), or the world as it is today? Summerhill  is a boarding school in England, but day schools run on similar principles exist in America and in several other nations as Sudbury schools, modeled after the original Sudbury Valley School  in Framingham, Massachusetts (here's a list from the Sudbury Education Resource Network ). Another alternative deserves mention here: home schooling. Freedom and compassion are life itself; their lack is the road to death. That will become increasingly true in a literal, global sense as we move deeper into the 21st Century. The staggering, exponential increase in scientific knowledge and technology, which is only just beginning, has created a stark and urgent choice for mankind: A free and healthy world, soon, or a technologically empowered global tyranny  – or perhaps even an extinction event for the human race . Free and compassionate societies exist in the real world right now, as indeed they always have. The time has come to expand their size and number until they merge throughout entire nations and, eventually, the world as a whole. Next week: How the Baby Boomers Almost Saved the World . . . and why they failed. * Lane discusses three large-scale attempts at genuinely free societies: the Jews of Abraham; Mohammed and the Saracens who followed him; and the Americans who fought off British colonialism. While largely ignoring the flaws of each attempt, she does a spectacular and eye-opening job of presenting the case that each of these societies was, for at least a time (in the first two examples for quite a long time) free in a manner that has seldom been seen before or since. Rose Wilder Lane expressed the love and freedom duality in a powerful and artful way: "All men are brothers and each man is free." ** Not every parent, no, and not in every particular.